Tucked away in the Japanese countryside rests an island overflowing with historical landmarks and cultural gems. This place is called Awaji Island, and it’s less than two hours from Osaka. To get here, most people drive across the Akashi Kaikyo Bridge, a two mile suspension bridge, the longest of it’s kind in the world. 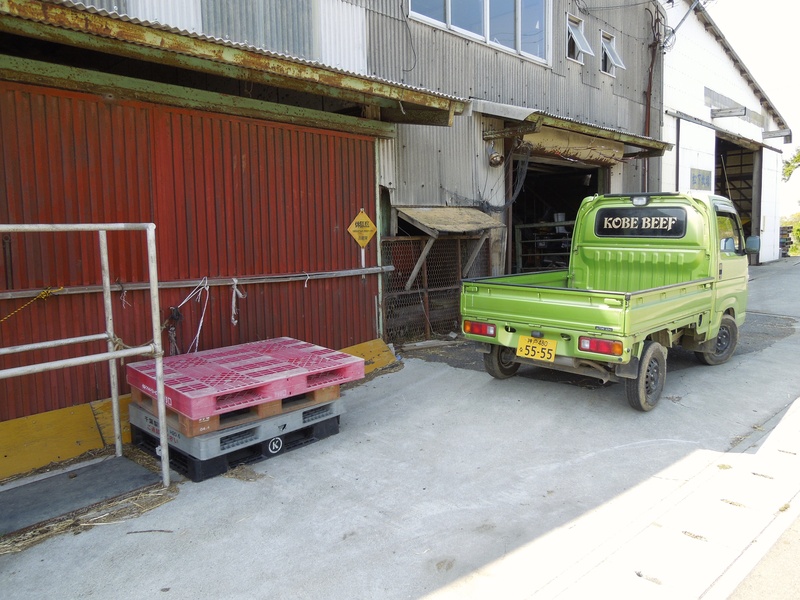 That’s about where state of the art technology stops on your trip to Awaji. Once you get off that bridge, you are immediately immersed in century old traditions. 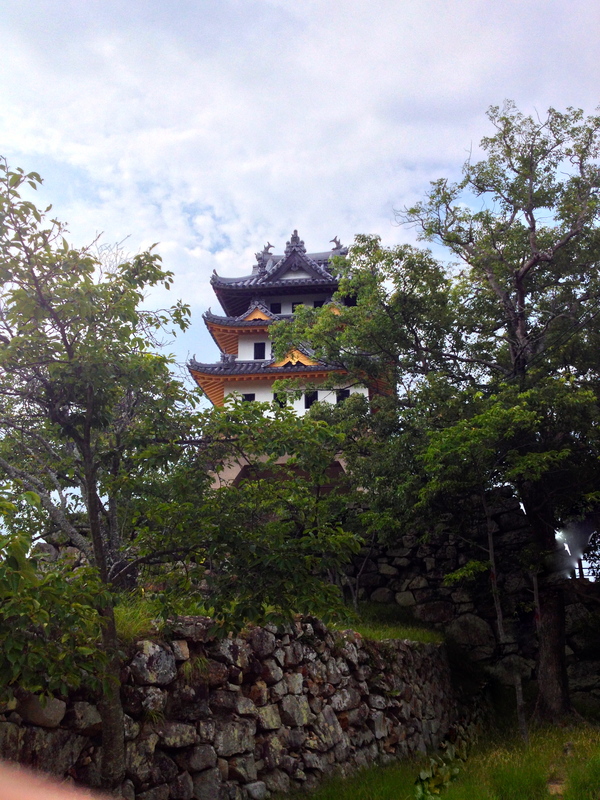 In fact, according to Japanese folklore, Awaji Island is the birthplace of Japan. As the story goes, the gods Izanagi and Izanami stirred the sea with a spear, and when they lifted the spear from the water, a drop of brine fell from the blade and hardened atop the ocean waves. Thus, Awaji Island was born. Soon Izanagi and Izanami descended upon its shores, to further develop the land of the rising sun. Far from the futuristic glamor of Tokyo, Awaji is suspended in a time where traditional values like, būshido, the unwritten code of honor and loyalty, continue to govern the locals. As a result, you can’t help but feel a more simpler way of life, whilst walking past cattle barns and onion farms. Now that I’m back in the states, I hope to give you a peak into some of the best places in Awaji where you too can begin to understand a very different Japan, away from Anime, Hello Kitty, and robots clustered in big cities. A place where you’re bound to venture where no other foreigner has been before. Without further adieu, here is my top ten list for Awaji Island activities. If you would like to add anything to the list, please leave a comment below. 10. 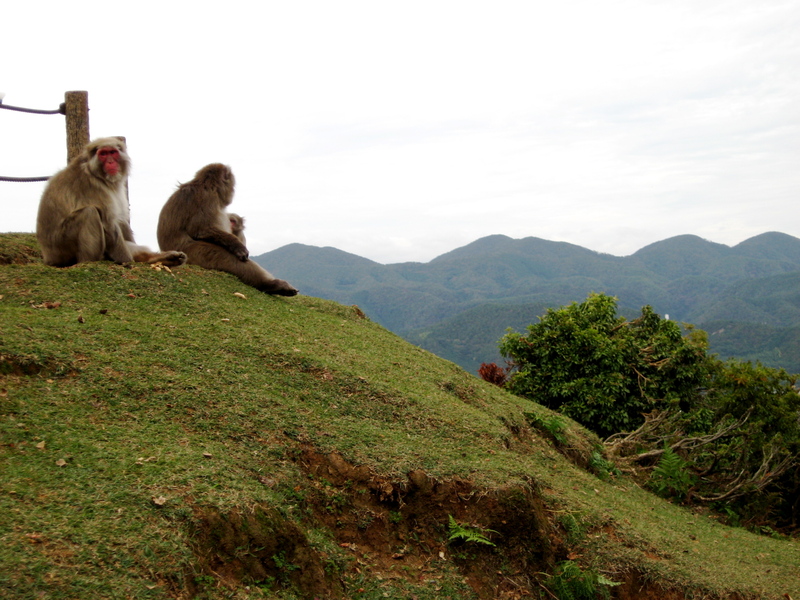 Visit Awajishima Monkey Center – Up in the mountains of the southern town of Naha, over 200 monkeys roam free. Visitors are sure to get some up close shots of these little guys. Just make sure you don’t stare them in the eyes. 9. 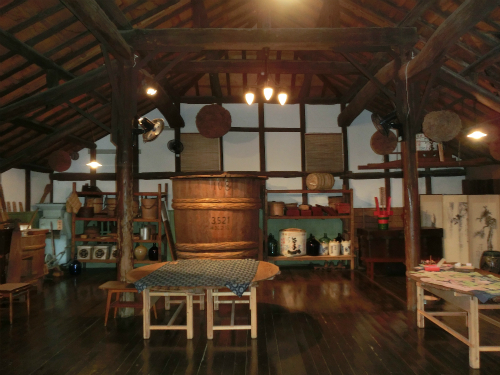 Tour Sennenichi Sake Brewery – Conveniently located on the main road in Higashiura, Sennenichi has been brewing there own house sake for generations. Based across from the town’s elementary school, I biked past this place everyday, but never had the chance to take a tour. Since I never actually went inside, here’s a photo from a travel blog. 8. Stroll through Izanagi Shrine – Since you’re on Awaji Island, it’s only fair you check out a beautiful shrine dedicated to the Island’s (and for that matter) Japan’s founder. 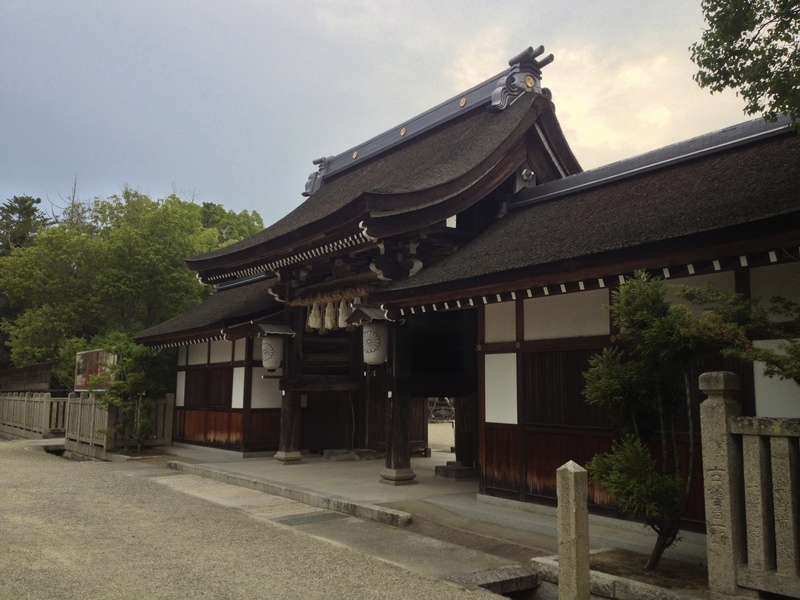 It’s said to be the oldest shrine in the country, but there’s no specific date on record. 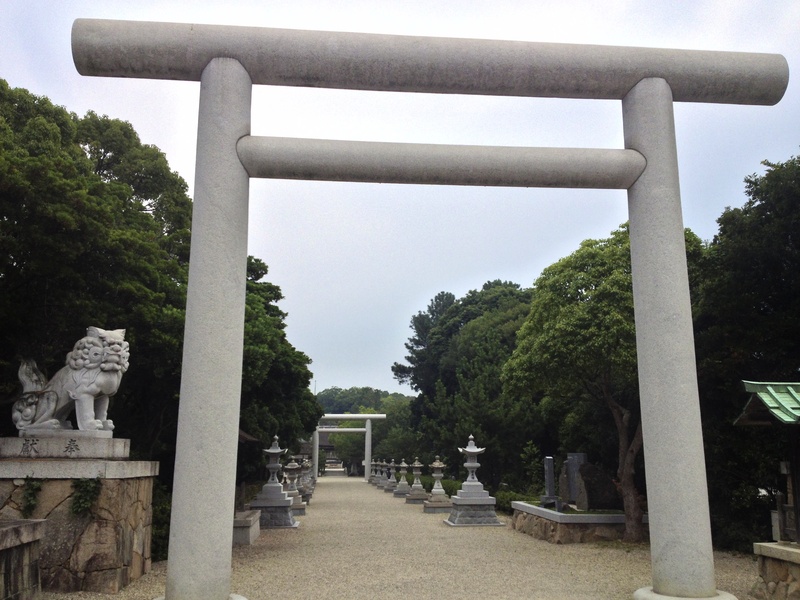 A beautiful stone walkway way lined with lighted pillars and a few over arching torii gates mark the grand entrance. It’s not uncommon to witness priests carrying out traditional shinto ceremonies. It’s also a popular spot for businessmen to pray for success, and students to pray for good grades. This is sure to be a very unique Japanese experience, as you will witness how Japan blends religion into their daily lives. 6. 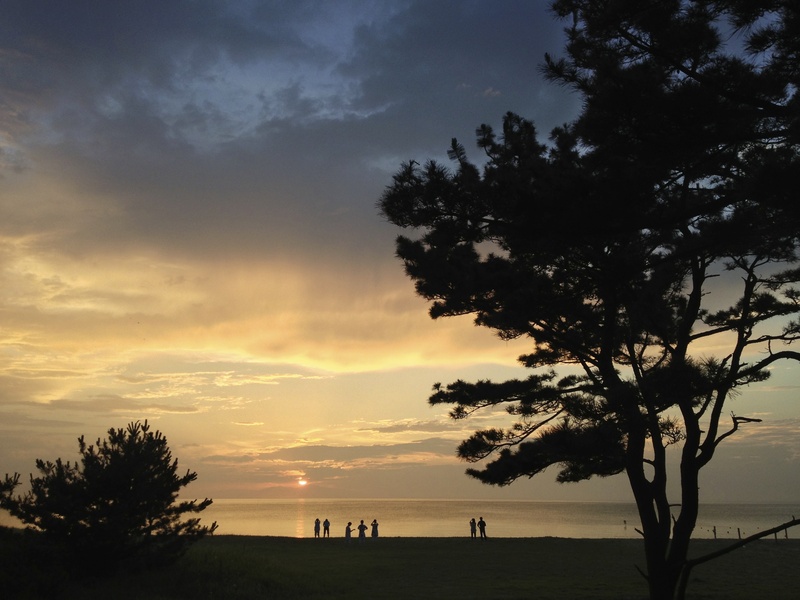 Enjoy the sunset on Keino Matsubara Beach – Hundreds of black pine trees dot the (almost) white sand beach on Awaji’s south western shoreline. It’s cleaner than most Japanese beaches, which isn’t saying much. Ironically, for being an island nation, relaxing at the beach is not as regular an occurrence as it is in the States. Be sure to stick around for magnificent sunsets, as the strip of road along the coast is not called, “Sunset Boulevard” for nothing. 5. 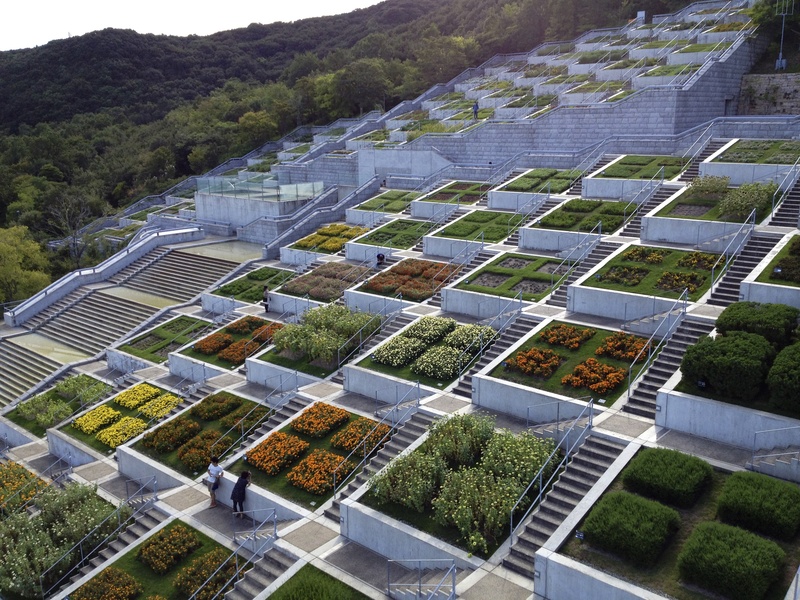 Explore Tadao Ando’s Yumebutai Gardens – In the wake of the Great Hanshin Earthquake in 1995, one of Japan’s most talented architectures, Tadao Ando, designed this magnificent modern feeling garden. Constructed alongside a resort conference center, lush gardens overflow the hillside with an endless staircases carved out of the side of the hill. Don’t worry, there’s an elevator too. Interestingly, much of this area’s land was removed and shipped across the bay to build artificial islands, like Kansai International Airport. 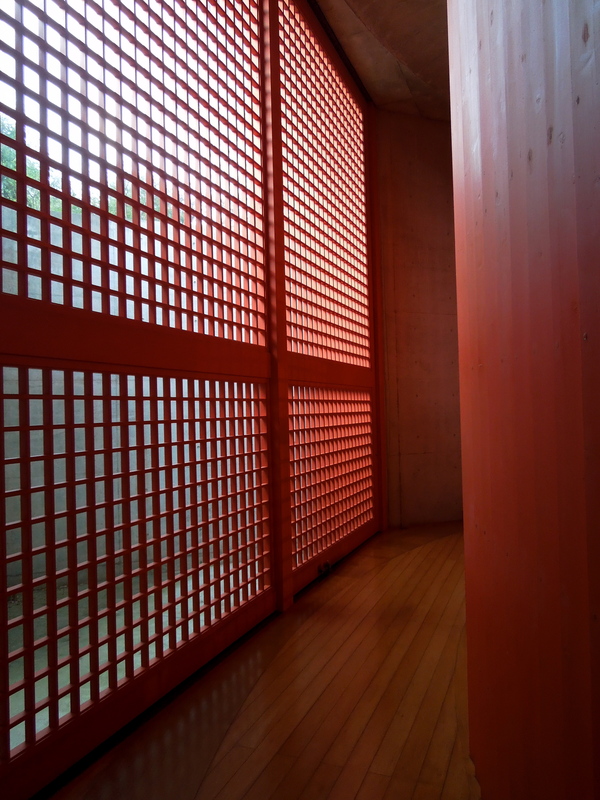 If you can’t get enough Ando, simply drive five minutes south to see his modern temple, Honpokuji; an underground temple below a glimmering reflecting pool. The first photo is of the garden, and the second is from inside Honpokuji Temple. 4. 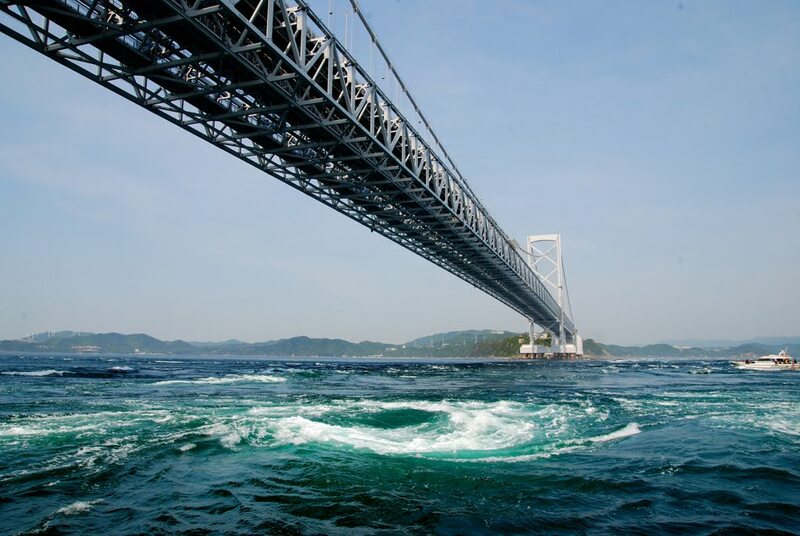 Sail through the Naruto Whirlpools – In a narrow straight connecting the Pacific Ocean to the Inland Seto Sea, powerful whirlpools swirl twice a day. The difference in water levels from each sea can reach extremes of almost five feet, creating the fourth fastest moving straight in the world. If you would like to get up close and personal, visitors can board a guide boat to snap closer pictures of the whirlpools. 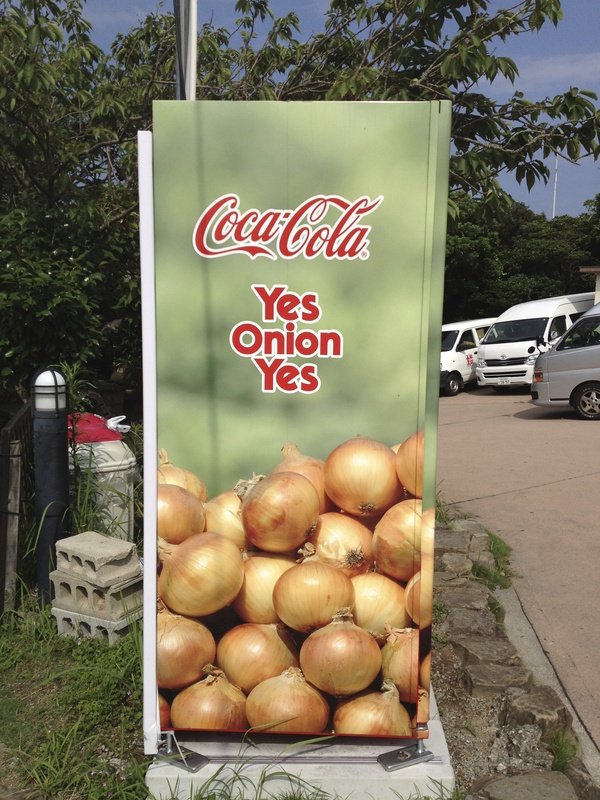 Be sure to look for the, “Yes Onion Yes” vending machine located outside the nearby restaurant and gift shop. This brings us to a good time for me to mention that Awaji is famous in Japan for their onions. You will see them hanging to dry all over the island. I missed the large whirlpool when I visited, so here’s a photo I found on google. 3. Ride Horses at Harmony Farm – I stumbled upon this horse farm while biking in the mountains on sunny spring afternoon. Many guests come from off the island for lessons. Spend an afternoon traversing through mountain passes and wading through calm ocean waters on a horse. 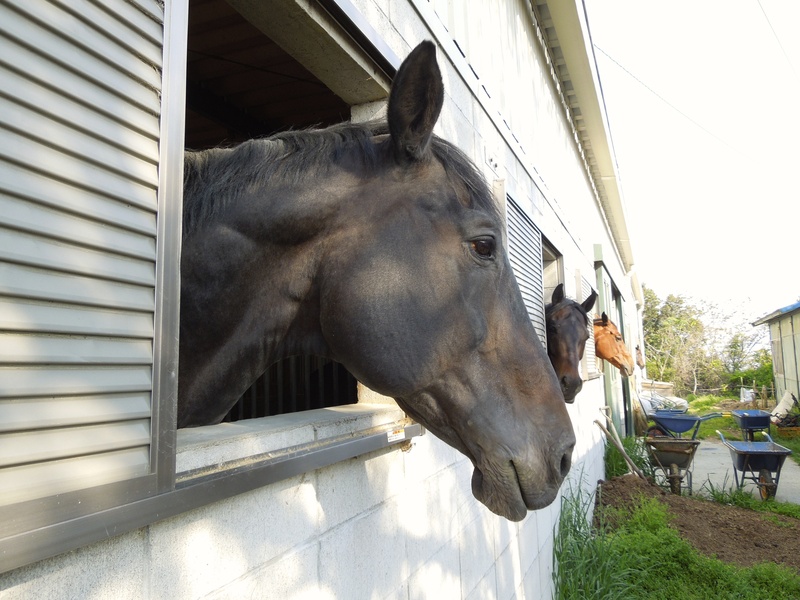 It turned out the one of the horse trainers was my next door neighbor. That solved the mystery of who was snoring so loud through my apartments’ thin walls. 2. Walk through Hanasajiki Garden, and feast on ice cream and burgers – I’ll be the first to admit that gardens are usually never near the top of my tourist attractions list, but Hanasajiki (Thousand Flower Garden) is bursting with vivid colors that beautifully carpet Awaji’s northern hillside. From the gardens, visitors have a grand view of Osaka Bay, and on clear days, even Osaka City itself. Make sure to try the seasonal soft serve ice cream, like “biwa” (loquat) in autumn, and sakura (cherry blossom) flavor in spring. I can’t recommend Hanasajiki without directing you to the best burger joint on the island, conveniently located just 2 minutes north up the street. The place is called, Awaji Country Garden. But the big sign is in Japanese (淡路カントリーガーデン). 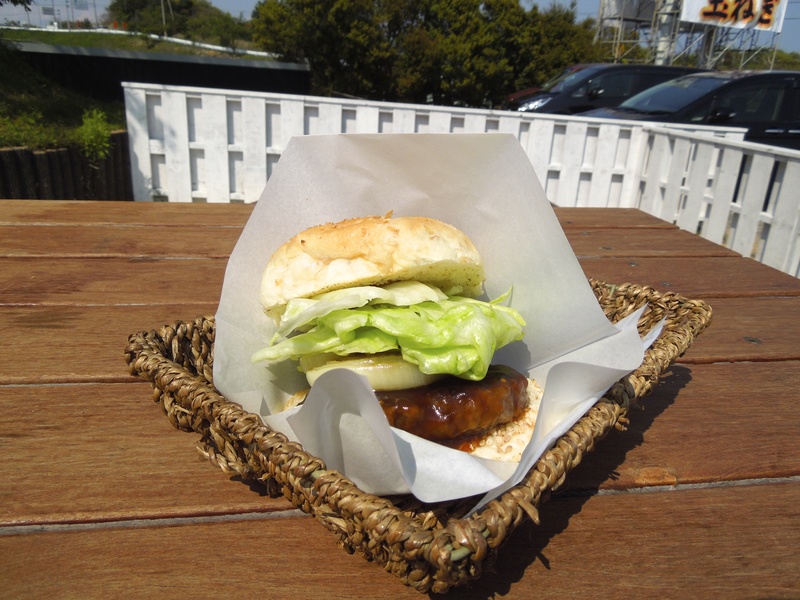 Unlike the other Awaji Island burgers, this guy is not made with shredded beef. Instead, guests get one thick and juicy patty topped with sweet caramelized onion rings and a secret burger sauce. Now would be a good time to remind you that the world famous Kobe Beef cows reside in the Awaji hillside. So yeah, the burger is unbelievable. I biked up a mountain and sweated through my T-shirt on a chilly spring day just for this burger. Okay, so maybe I only recommended this garden for the nearby burger joint (Oops!). But the flowers are still beautiful. 1. Soak in Matsuho-no-yu Hot Springs – After a full day of exploring Awaji Island, you’ll need a bit of rest and relaxation. Luckily, Awaji is blessed with a number of onsens. However, none command a view as scenic as Matsuho-no-yu, perched in the northern hills over looking the two mile Akashi Kaikyo Bridge. The bridge is lit for a few hours starting at dusk, and for five minutes on each hour, an enchanting rainbow pattern of lights reflects off the water and fills the sky. The best way to enjoy the light show is from soaking in an outdoor onsen. It’s probably not a good idea to bring your camera to a public bath, so here’s a photo from their website. Here’s a map labeled with each location mentioned above. Click on the pin for more information. Don’t have a car? No worries. Just hop on the Jenova Ferry from Akashi. In twelve minutes, you’ll be dropped off in an old fishing village called, Iwaya. This is the only boat to the island (the city planners are clearly not prepared for a zombie apocalypse). You can rent bikes at the port terminal building for 500 Yen for two hours. Or 1,000 Yen for the day (9:00 AM – 4:30 PM, 0799-72-3420). Additionally, you can catch a bus from Sannomiya station in Kobe to Higashiura Bus Terminal in Awaji. Or catch the same bus later, alongside the highway at Maiko station. The 55 minute ride from Sannomiya is 900 Yen. The 25 minute ride from Maiko is 600 Yen. The 1.5 hour ride to Sumoto, the largest town on the island, is 1800 Yen. Click here for directions to bus stop, and here for the timetable. 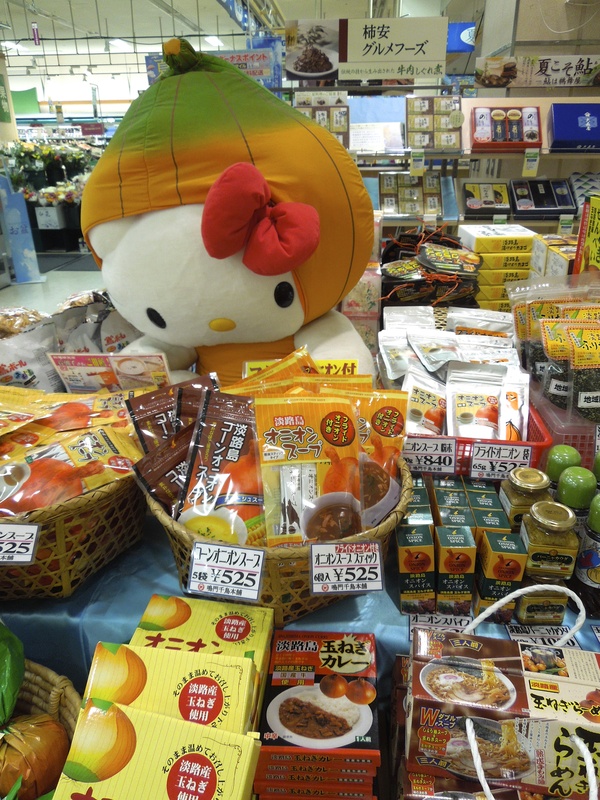 Did you really think there would be no Hello Kitty on Awaji? This is still Japan. I present you Hello Kitty…onion style. This entry was posted in Culture, Food, Life on Awaji, Temples & Shrines, Traveling in Japan and tagged Awaji Country Garden, awaji island, Awaji Island Attractions, Awaji Monkey Center, Hanasajiki, Harmony Farm, Honpukuji, Izanagi Shrine, Keino Matsubara, Kobe Beef, Matsuho-no-yu, Naruto Whirlpools, onion vending machine, sennenichi sake, Sumoto Castle, Tadao Ando, Yumebutai. Bookmark the permalink. Another marvelous post with such helpful information. We are planning a trip to Japan and keeping a to-do list. This info is very helpful. Thanks so much! All the photographs of your Awajishima are beautiful. Thank you! Awajishima is a beautiful place. I just stumbled upon your blog and got so excited since I am from Awaji. Your videos and photos are so cool! Made me homesick. I live in the States now but have my friends and family there. I graduated from Higashiura Chugakko long time ago. Are you still in Awaji or back in the States? You may know people I know there. Shoot me an email if you would like. I’m glad you liked the blog. Thanks for reading it. I actually taught at 東浦中学校. There are many nice people there. I’m back in the states now, but I miss Awaji. I worked with Ueda Sensei at Higashiura JHS, and I also taught at Iwaya JHS. But I don’t remember a Nishi Sensei. Teachers are both schools were incredibly kind to me and they made it easy for me to immerse myself in Japanese culture. Ueda-sensei was my English teacher as well as basketball coach. My friends and I have been talking about taking a trip to Japan together and my google search on Awaji led me to your blog. I will share the link with them and I am sure they will enjoy it. How many JET teachers get to go on a boat with local fishermen? I truly enjoyed your blog and it made me want to go back home soon. Thanks! Thank you for the compliments. It was fun updating the blog while I was in Awaji. I’m not sure how many JETs have been fishing with local fisherman. I was lucky and met the fisherman at 打ちっぱなし near HIgashiura JHS. He didn’t speak any English but wanted to take me fishing out of 森漁港. I’m glad I went. It was a great experience! I hope you get the chance to visit Awaji soon! Hello Stephen, Thank you very much for your information about Awaji, I really love to go there on my vacation. Sorry for my poor english. Could you please explain how to go to Hanasajiki Garden from Maiko Station? This is my first time to go to Awaji from Thailand. Thank you for reading my blog. From the Maiko train station, walk up the stairs and take the escalator up to the highway. The bus will stop on the side of the road at zone 2. Take a bus to Higashiura 東浦 bus terminal. There are bus schedules listed at the station. I believe it will arrive every 30 minutes starting from Sannomiya and stopping at Maiko. At the Higashiura bus terminal you can take a 10-15 minute minute taxi ride to Hanasajiki Garden. Enjoy! would 2 days be enough for a taste of the island? Hi! This is very informative. I really appreciate you writing this because there is so little info about Awaji island around the internet. 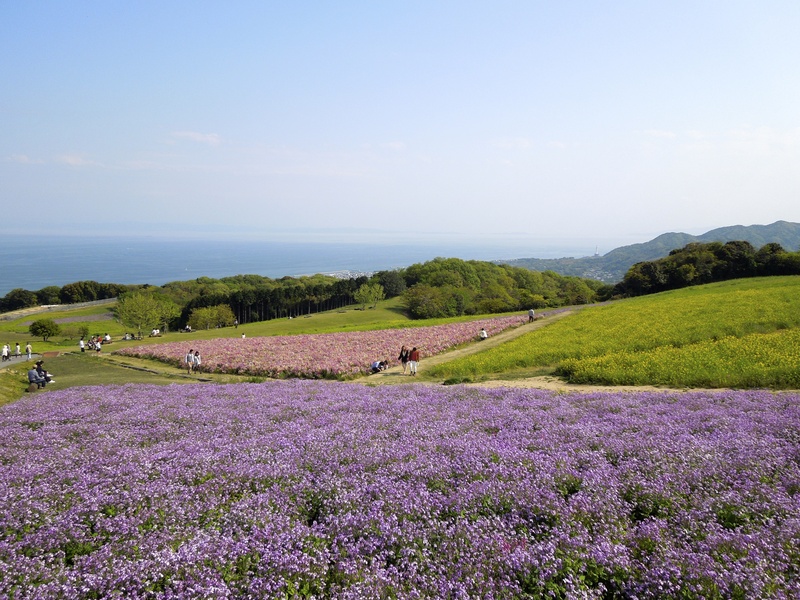 I love landscapes and flowers and since these are two of the top attractions of Awaji (aside from onions and burgers), I would love to go here. This post really helps, so thank you for that. I wonder if you ever heard about Nada-Kuroiwa Suisenkyo during your stay? The Narcissus Daffodil field is really lovely. Sadly. I do not find bus routes and schedules going there (travel guide/books/blogs goes only as far as Sumoto). I plan to go there this December. If you know anything, care to share? Thank you for checking out the blog! Nadakuroiwa Suisenkyo is beautiful. It’s located near the monkey center in Minami Awaji. I believe the flowers are in full bloom from the end of February through March. Unfortunately, I’m not sure of any bus schedule, as I went there via car. I would suggest renting a car to get around Awaji, as it’s pretty country. Enjoy your visit. Hi, very nice information and beautifully written.I am planning to visit Kobe in 2nd week of October this year and I was serching internet for information about the sites to visit and stumbled upon your blog. Got many information , thanks for a lot. I need one advice, if I have to go for a day to Awaji island, what are the must visit places ?I will travel with my family along with 11 year daughter. Thank you for checking out my blog. Since many places on Awaji Island require a car, I would suggest visiting the main attractions on the northern part of the island, which are easier to get to. For a daytime activity, I would recommend, Hanasajiki Garden. For food, go to Hayashiya Sushi 林屋 in Iwaya, near the boat terminal. It’s the best sushi on the island. I would end the day at Matsuho-no-yu onsen. 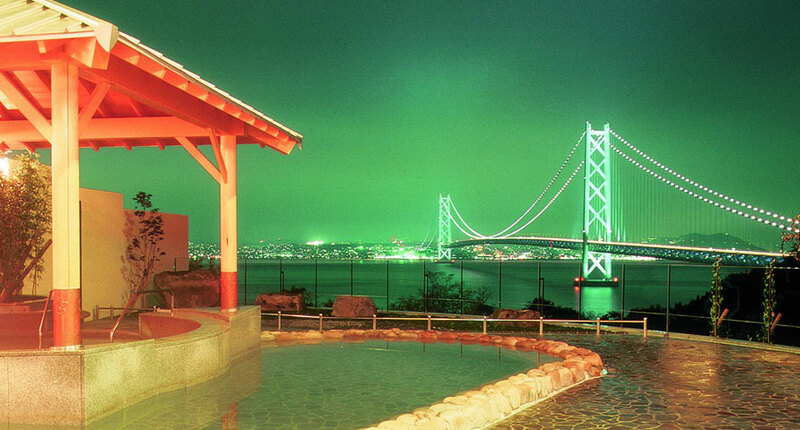 Here, there is a very nice outdoor hot spring overlooking the bridge. Enjoy your visit! Well done. Beautifully written and informative. Thanks for the reading! I hope you have the chance to enjoy Awaji. Thank you so much for this post! I am traveling to the MINAMI-AWAJI, National Park Resort Villages from the US to vacation with my Japanese wife’s family this late July through early August and was looking for information on local attractions. This top ten list is wonderful. If you or any of your subscribers have additional information on local fishing charters on Awaji I would be very interested in that as well. I am also a home brewer and love sake so I am very interested in visiting the sake brewery. The burger place, and gardens you suggested is also on top of my list. Thanks again! Thank you for reading the blog! I never went on any fishing charters. But I’m sure there are a few around. Enjoy your stay in Awaji! Hello, Many many thanks for this wonderful information and for your blog. I adore gardens and scents and spas, so am enthralled with what you have shared. 🙂 I am studying the fishermen’s coats made on Awaji Island and trying to incorporate those stitching designs into my artwork; they are so lovely and full of meaning and history. A few years back I discovered a book about these coats authored by Dr. Takeda. I hope to visit the island and Kyoto in 2017 or 2018; a dream! Do you perhaps know of a small museum on the island that supposedly has some of the coats? I aim to learn a bit of Japanese, but will I be OK travelling solo on the island? Greetings from Boston, Massachusetts! Don’t worry, will be fine traveling through Awaji without knowing the language. Enjoy planning for your trip! Hello. Your blog is very helpful. I plan to visit Japan with my friends in early January, 2016, and will probably spend one day in Awaji island. We will rely on public transport. My current plan is to take the bus from Maiko to Yumebutai(舞子・津名線), visit Yumebutai, and then go to Matsuho-no-yu hot spring. Is one day enough for this trip? How to get to Matsuho-no-yu hot spring from Yumebutai by public transportation? Given this plan, where is the best place for accommodation if we are coming from Kobe? Thank you for reading the blog! Unfortunately, I don’t know which bus goes to matsuho-no-yu hot spring. There is a Westin hotel connected to the gardens, and I would suggest asking one of the Westin hotel employees for directions. Also, there is a shuttle bus that runs between the Westin hotel and the hot spring. But it might be for hotel guests only. Enjoy your trip to Awaji! Hi this is a good article on awaji island. I wanted to now is it possible to take a bus from Nara to kotihara and honpukuji? I am keepng nara as my base. Hi, will be there mid Sept.. Is it a good time? The weather in September is awesome. It’s a great time to visit! I’ve been enjoying all your posts and videos so much. Thank you so much. I first visited Awajishima in 1970 on a summer program through the Lions Club and have been back many, many times. My host family owned a dress shop on Honmachi that is still open, with their grandson managing the family business. Are you back now permanently ? I precisely wished to say thanks yet again. I do not know what I would’ve done without those tips and hints revealed by you over this field. This was a real daunting issue in my position, however , considering a well-written fashion you handled it forced me to cry for joy. I’m just grateful for your help and then wish you are aware of a powerful job that you are providing instructing others via a web site. I know that you’ve never encountered any of us. 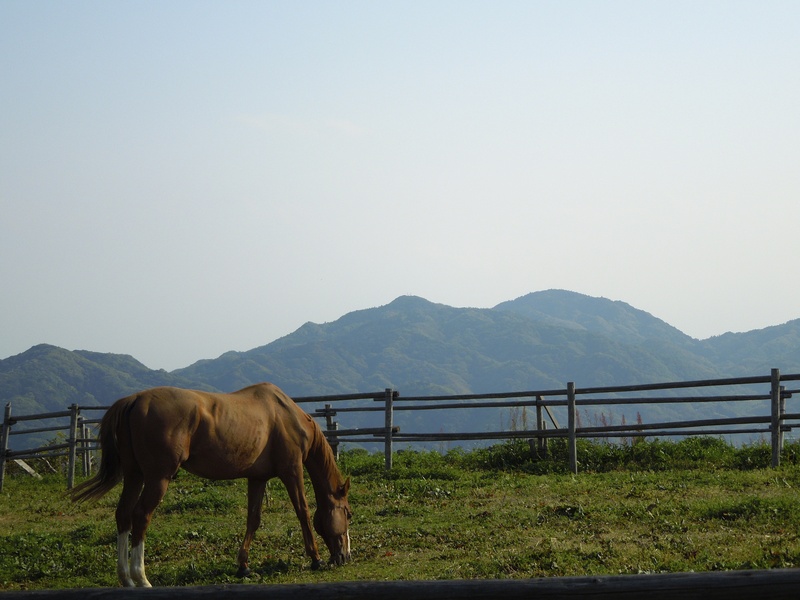 Hello, nice blog about Awajishima. But, what about local bus? If I want to go to all those location you mention above, and I don’t have car, what should I do? by taxi? Thank you for checking out the blog! There’s a lot to do on Awaji Island. I would suggest using a taxi to get around, because the bus doesn’t run very frequently. Hello. What a beatiful photos.places. i want to see there. Hi Stephen. Are you still in this island? Would like to make a day trip to here covering your list no. 2,3,5 & 7 from Kobe. Doable? Can you advise from Sannomiya station? Or better can you personally guide us 2 ladies? We are from Malaysia. Thanks alot. Hi there, great post. I really like the outdoors, fishing, camping & hunting. Folks spend much too much time indoors watching the TV. Thank you for sharing and making us inspired.